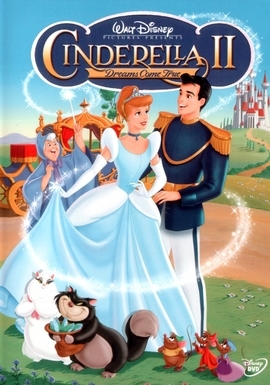 Cinderella: I have been trying to obey someone else’s rules about who I should be and how I should dress. This hair ewww…. [changes her outfit] I know can do this I just have to stop trying to be someone else. Gus: Eh, what’s she gonna do, Jaq Jaq? Cinderella: Gus, I’m gonna plan this banquet my way! Anastasia: What are you doing here dressed like that? You look like a laundry maid. Cinderella: I’m not the one with egg on my face. Anastasia: What would you know? Its always been easy for you. Cinderella: Easy!? That’s not how I remember it. Cinderella: Remember you’ll catch more flies with honey than with vinegar. Anastasia: What does that mean? Who would wanna catch flies? Cinderella: I mean the best way to impress the baker is just to be nice to him. Anastasia: How do I do that? Cinderella: You could start with a smile. Anastasia: Better get me a bigger necklace! Cinderella: There good as new. Anastasia: Don’t stop now. Mother says that looks count for everything. Anastasia: Yah, yah, yah what I need is a whole new look! Prudence: At the banquet as always the royal menu shall consist of the rarest roast beef, French onion soup, darigin mashed potatoes, freshly baked baguettes, the finest truffles in the kingdom, and for dessert…Norwegian stewed prunes! Prudence: Your highness, a princess never prepares her own meals. That is not how things are done. Cinderella: There are rules about breakfast? Prudence: But of course there are rules, your highness. Prudence: This is a disaster. Cinderella: Oh, look! We're all in here, and these our stories. Cinderella: "Once upon a time, there was a big castle, and in this castle lived a prince and a princess..."
The King: I can see my castle! Prudence: The princess is missing! [points to Cinderella] You, you girl, have you seen the princess? Prudence: Oh I thought you…but those awful clothes! I didn’t recognize you, your highness.